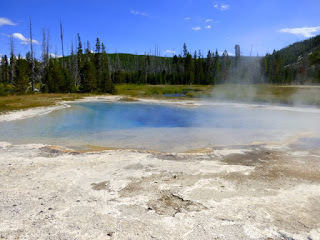 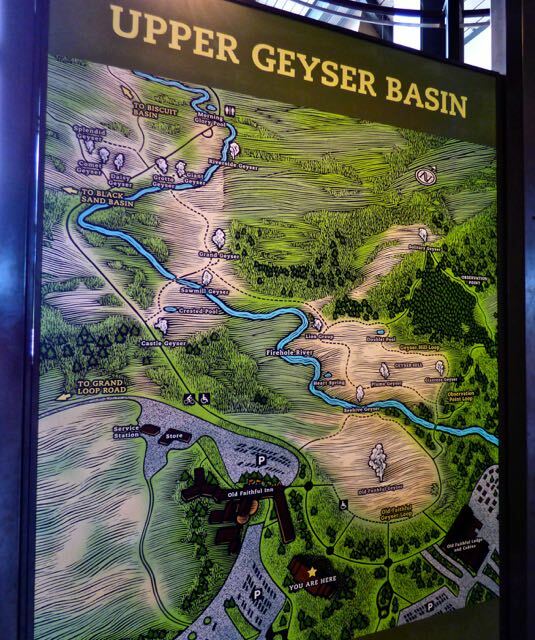 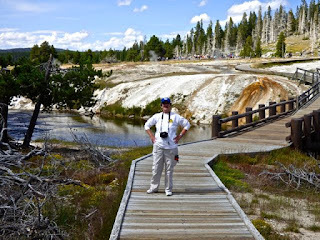 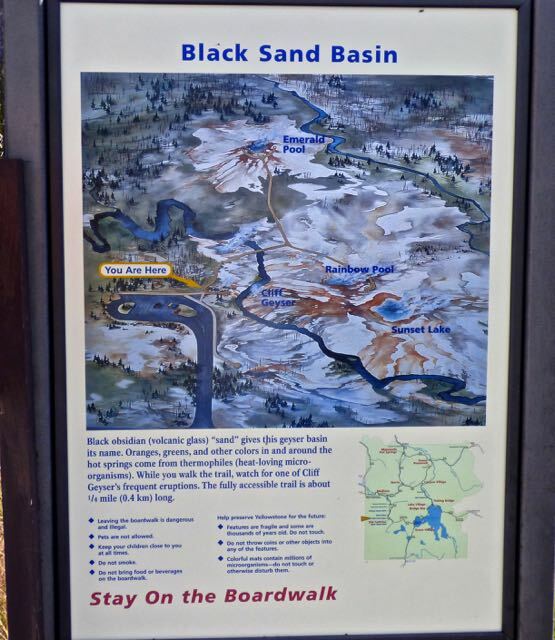 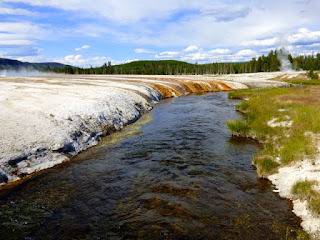 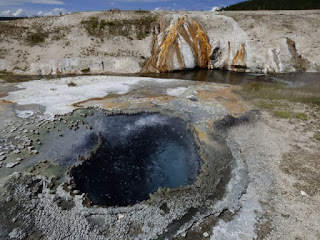 Upper Basin and Black Sand Basin Geyser Tours this afternoon. 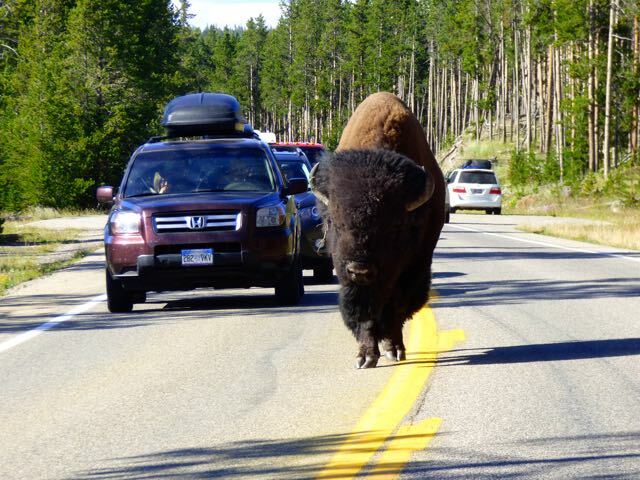 We started out in the morning, but the line into the West Entrance was backed up for 2 miles. 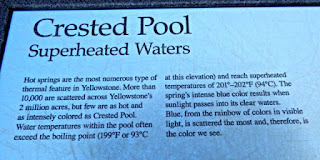 Besides the afternoon weather was much sunnier. 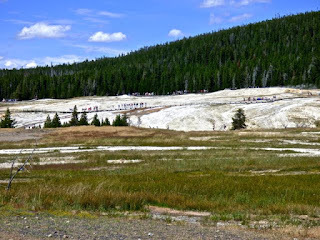 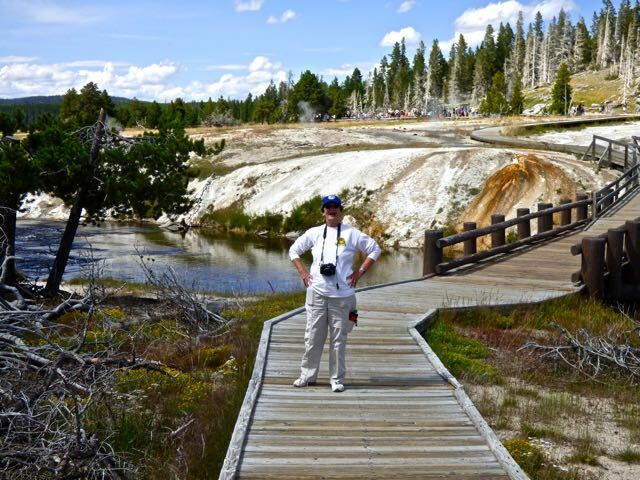 The Upper Geyser Basin near Old Faithful has at least 150 geysers packed into 1 square mile. 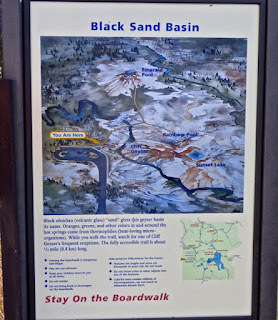 The walking trail is 3 miles;however, we only did 2 miles. 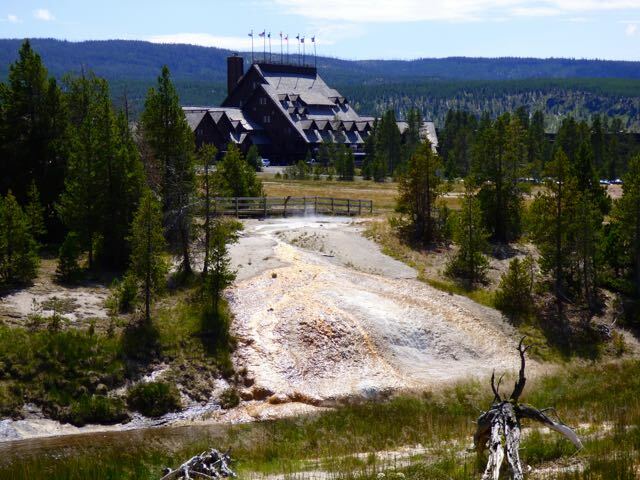 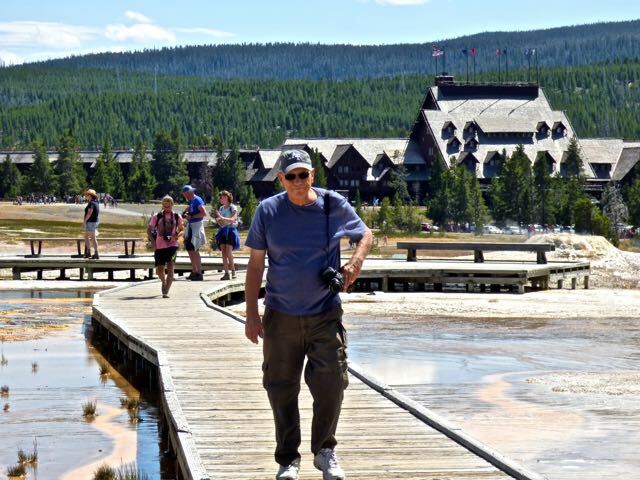 The trail starts at Visitor Center with the return back to Old Faithful Inn. 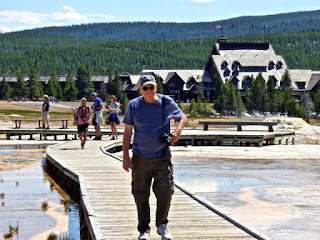 Wasn't sure I could make it due to altitude and endurance, but happily I did and we treated ourselves to ice cream at Hamilton's General Store on way to parking lot. 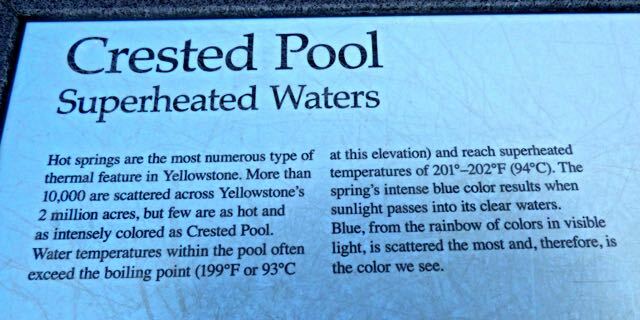 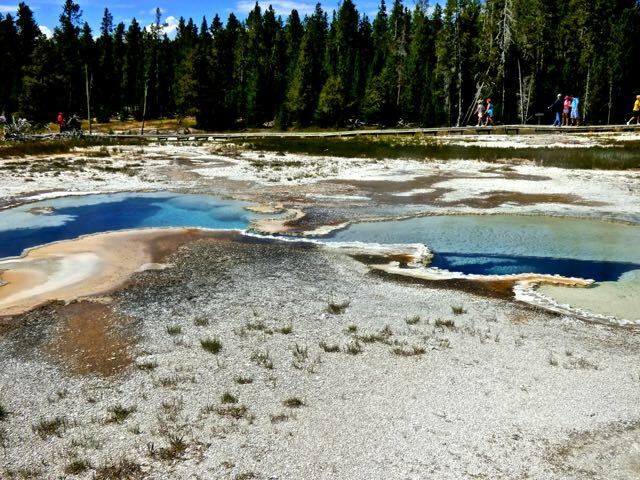 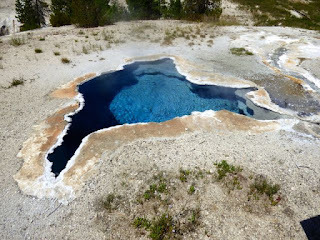 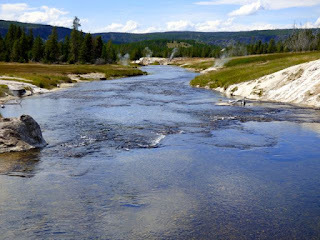 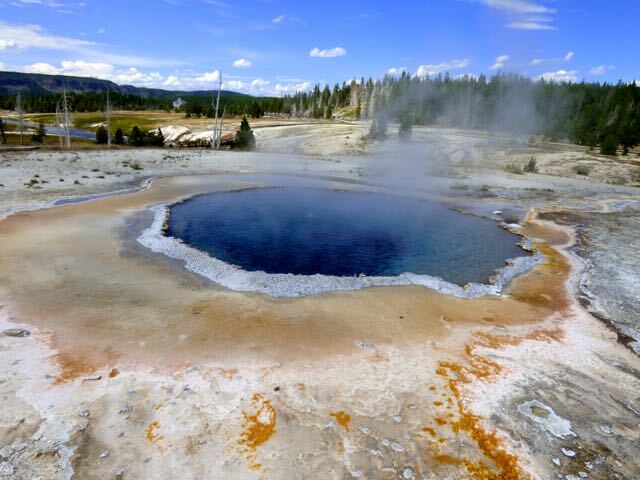 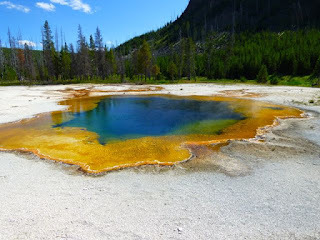 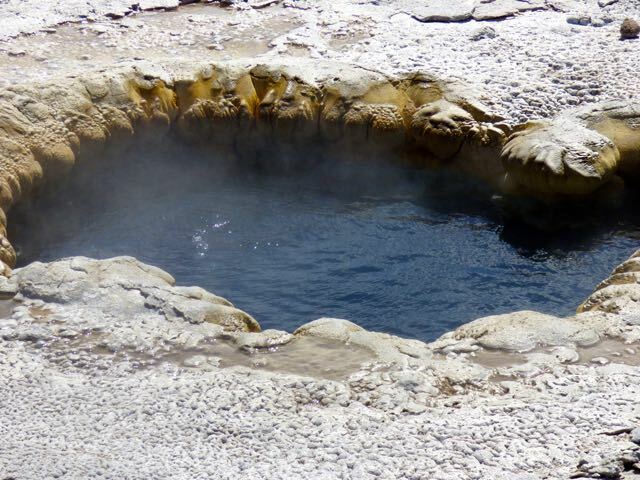 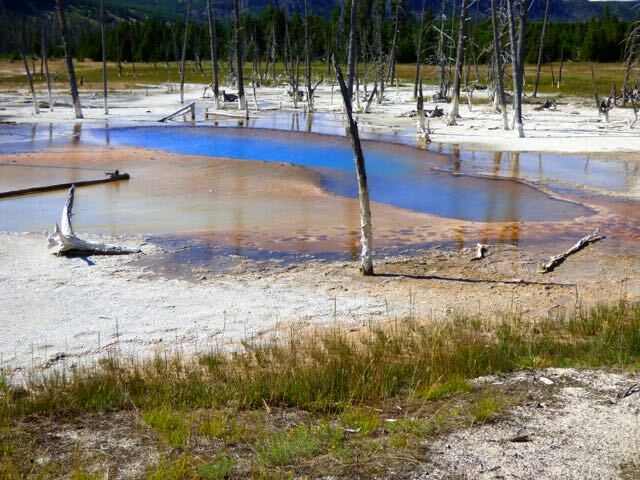 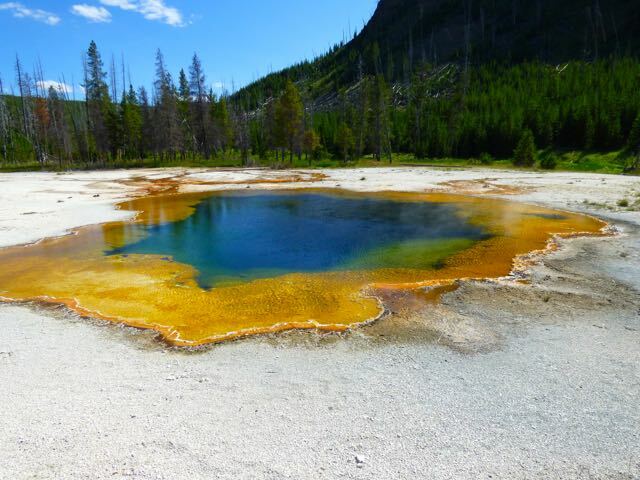 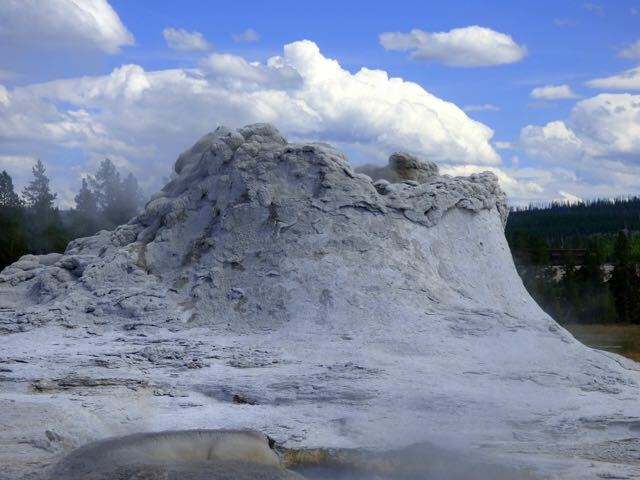 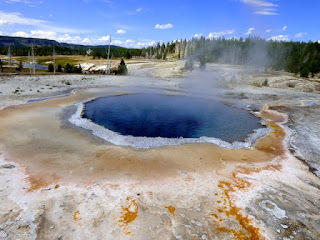 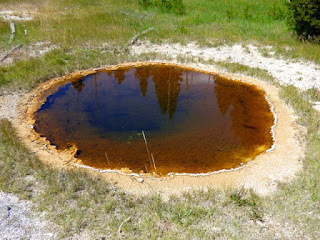 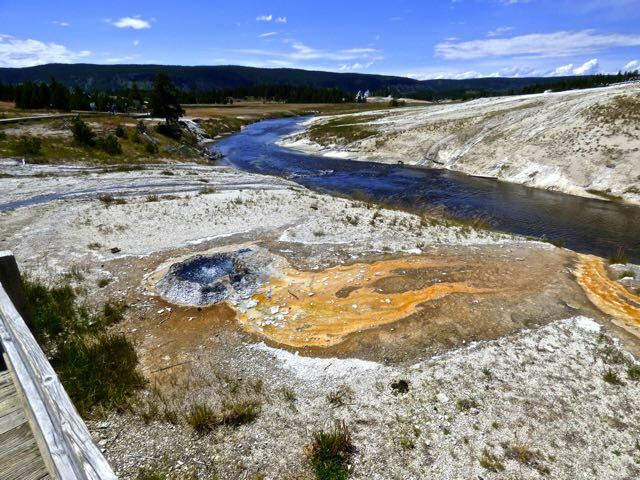 Yellowstone contains some 500 Geysers and 10,000 thermal features. 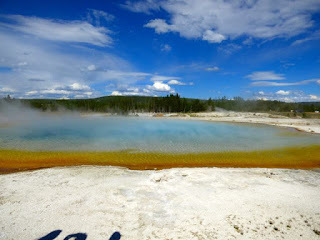 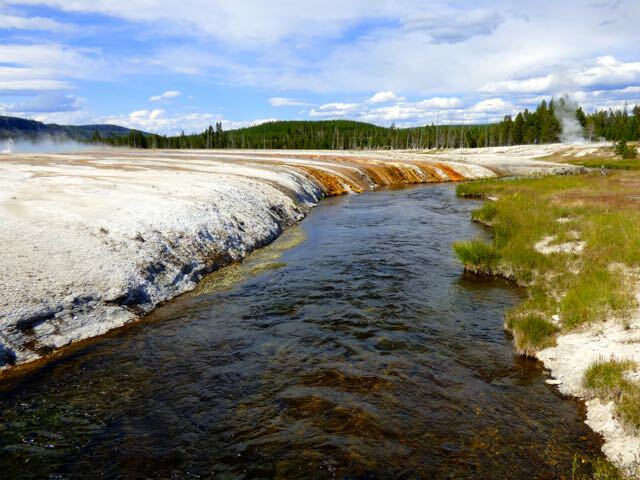 Much of Yellowstone sits inside and ancient volcanic caldera with the last major eruption occurring more than 600,000 years ago. 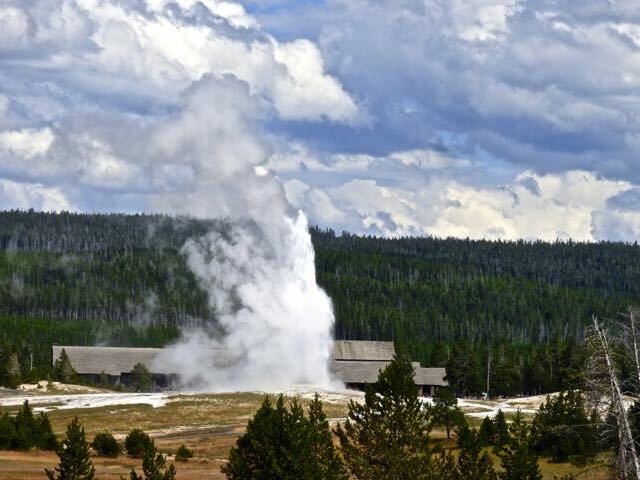 Old Faithful erupts every 35 to 120 minutes for 1.5 to 5 minutes with height ranging from 90-184 feet. 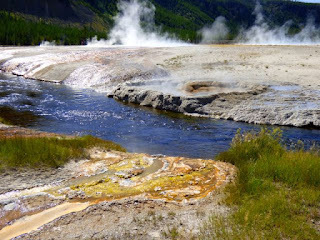 It is not the biggest or most predictable,but biggest regular geyser in the park. 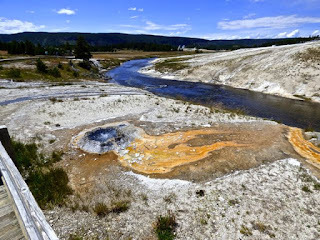 Grand Geyser in the Upper Basin is the largest and lasts longer, but unfortunately it cannot be predicted as accurately as Old Faithful. 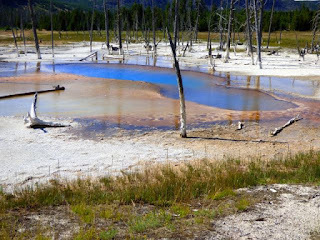 Our next stop was Black Sand Basin only 1/2 mile from Old Faithful. It got its name from the small fragments of black obsidian sand which covers part of the basin. 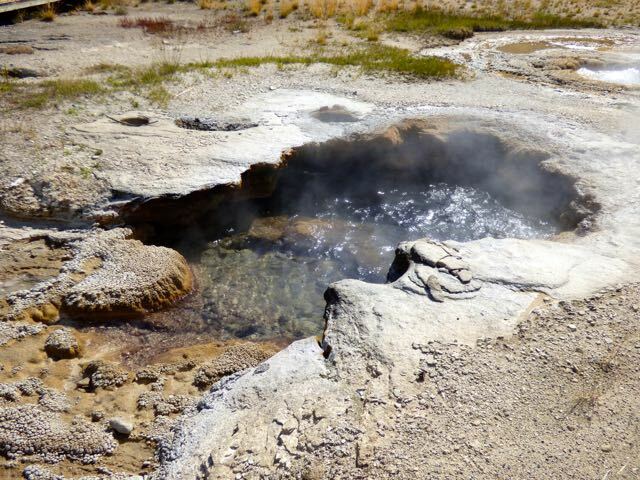 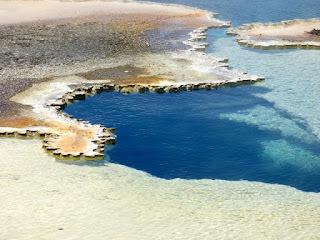 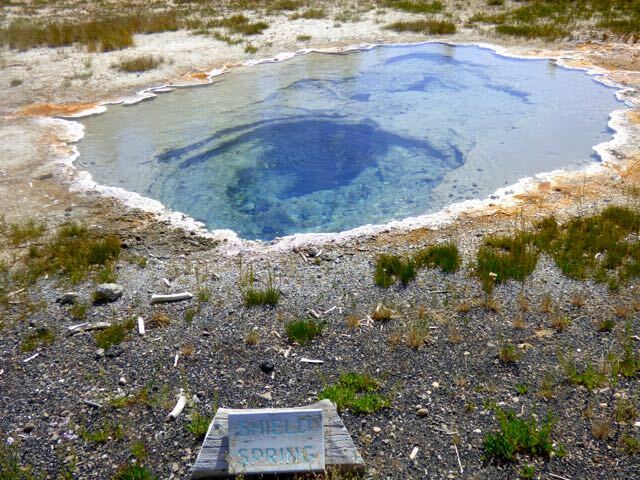 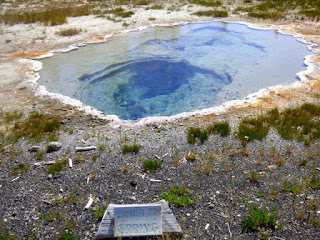 The Basin contains a small group of geysers and hot springs. 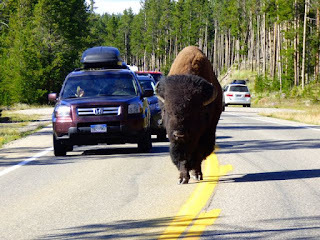 On our way back, a huge traffic jam delaying us about 45 minutes caused by a meandering bison. 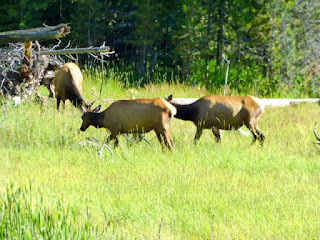 Also spotted some elk in the meadow. best pizza place in West Yellowstone.